That’d be well and good if the borough manager’s designee was someone who followed the codes and ordinances. In too many instances, that person “Jeffs up” by having interpretations based on who the person(s) is(are). “It shall be unlawful and a violation hereof for any person to knowingly and willfully make a false statement to any public official for purposes of obtaining a handicapped parking space.” Wonder whether it’s equally unlawful for the public official to make a false statement to any person? “The Code Enforcement Officer or his designee shall review all requests submitted for reservation of a handicapped parking space and shall submit to the Borough Manager a recommendation regarding each request.” Wonder how often this is Jeffed up? “The Code Enforcement Officer shall, in writing, notify the adjacent property owners that an application has been submitted and that they can submit to the Borough Manager, in writing, their support or opposition to the request. The notice shall set forth the date and time by which such written support or objection must be received by the Borough Manager. Wonder how often this is Jeffed up? “Any applicant wishing to reserve a handicapped parking space on any street within the Borough upon which public parking is currently permitted shall submit a written request to the Borough Manager.” Wonder whether that always happens? “A description of the physical impairment of the resident, a statement as to whether the impairment is permanent or temporary (if temporary, a detailed statement of the anticipated term of the impairment) and whether a device such as wheelchair, crutches or walker is used by such resident for locomotion. The applicant shall supply with the written request proof of the resident’s asserted medical disability from a medical doctor, doctor of osteopathy or doctor of podiatry medicine (collectively, “physician”). The physician’s statement must be signed by the resident’s physician, must not be issued more than six months prior to the date of the written request and must specifically set forth the nature of the impairment, how the impairment limits the resident’s mobility and the estimated duration of the resident’s impairment.” Wonder whether PennDOT’s Persons with Disabilities Parking Placards stipulations are considered? If summer weather ever arrives, there’s great music options for those of us lucky enough to live mid-way between York and Lancaster. Springhettsbury Township Parks Summer Series is Sunday and Wednesday evenings beginning June 10. 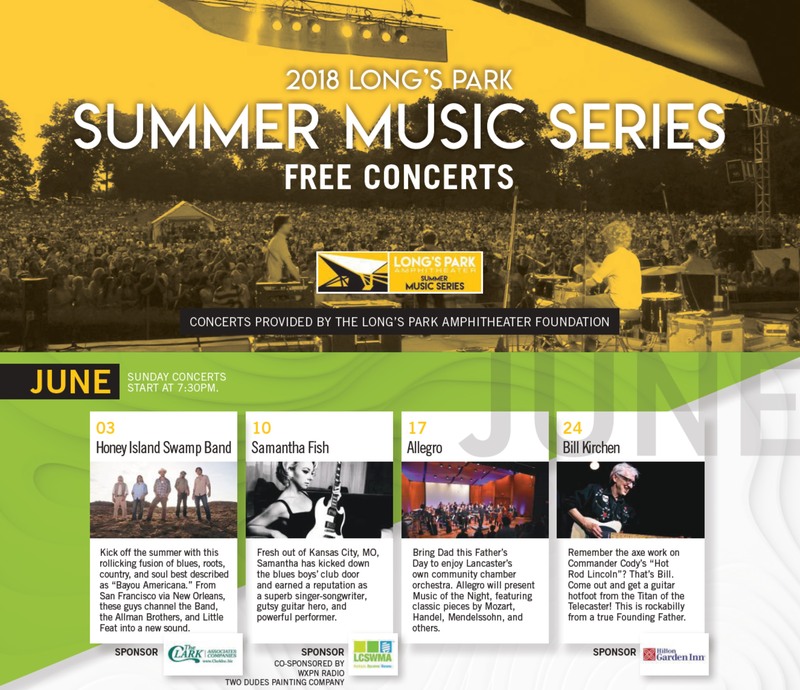 Lancaster’s Long’s Park Summer Music Series is Sunday evenings – the first was last night. American Treasures – at the National Association of Watch & Clock Collectors’ (NAWCC) in July.